Arista announced on July 15, 2014. Distinguishing features: Very deep buffers, 100 Gb/s uplink ports. Of course, announcement is not the same as shipping product. In a webinar, Arista said that the QSFP100 model will ship at the end of the year. The other two models will have first customer shipments in September 2014. A trade magazine article ties these switches to Broadcom's Dune. There are three models. One has port parity with Broadcom trident switches (48 10-Gb/s ports and 4 QSFP 40 Gb/s uplinks). The others have 100 Gb/s uplink capability. This is explained in the data sheet. According to Q&A on an Arista webinar, buffering on 100 Gb/s ports is 1500 Mbytes. The target is 50 mS.
As is often the case, more details are available to those that dig. The switch Q & A has more details about switch buffering. 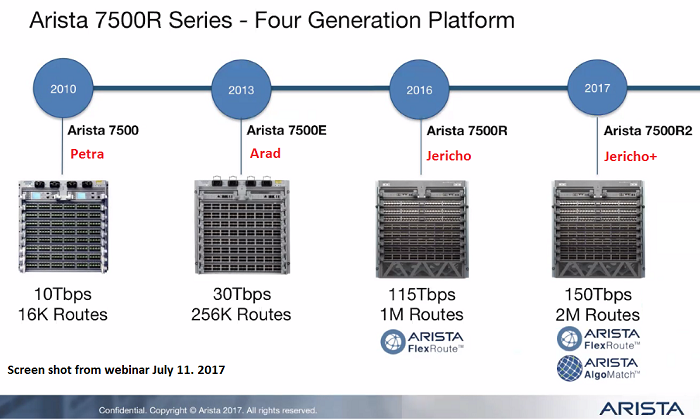 According to Arista, this is the same technology as their 7500 flagship chassis switch presented in a 1 RU fixed configuration package. Some information on list pricing is available in the trade rags. As is common on this website, the data sheets are copies rather than links. This is to allow detection of changes. You may get more current information from the vendor's web page. The 100 Gb/s MXP interfaces use 10 Gb/s SERDES, so ten lanes. Actually twelve lanes, ten are used in 100 Gb/s mode. The original data sheet has been updated; the QSFP100 parts are no longer marked with an asterik to indicate future availability. See vendor's web pages. These are list prices, and no one pays list.